ALL ingredients are 100% natural. Guaranteed free from wheat, gluten, dairy, yeast, sugar, corn or GM ingredients. Serrapeptiopeptidase is a natural, proteolytic enzyme, proven to reduce pain & inflammation with no side effects; it has been used clinically for over 30 years throughout Europe & Asia, with none of the dangerous side effects of NSAIDS, Ibuprofen etc; in forward thinking Germany & Austria, it is even available on prescription. 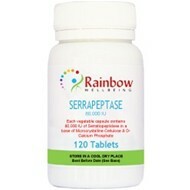 Serrapeptase is also an effective supplement to improve your cardiovascular health. As we age the circulation tends to become clogged; so if you want to improve your circulation, have severe clogging or high blood pressure, Serratiopeptidase would be a great addition to your health regime.